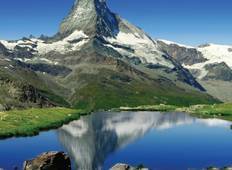 Find a Coach / Bus trip that explores Switzerland. There are 16 tours to choose from, that range in length from 6 days up to 14 days. The most popular month for these tours is May, which has the most tour departures. "There was one bad hotel in San moritz...hotel Baren. Dinners included were mediocre...."
"The itinerary included places within all the different languages spoken in Switzerland..."
"Super unorganized tour- it wasn’t Sofia’s fault but I would say it is the way..."
"We did the Canada trip with Ben Hutchinson as the guide, was one of the best trips..."
"I feel so lucky to have travelled on such a beautiful tour!!! The Vista of Switzerland..."
"I won’t be travelling with Europamundo ever again. Too disorganised for me. I can..."